From 9th to 11th June 2016, the IIEP Policy Forum 2016 took place in Xiamen, China. 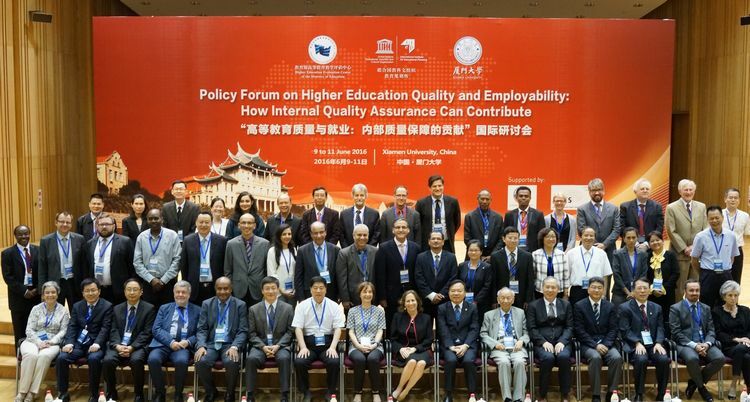 The conference was organized by the UNESCO Institute for Educational Planning (IIEP-UNESCO), the Xiamen University and the Chinese Higher Education Evaluation Centre (HEEC) to examine how internal quality assurance (IQA) can contribute to higher education quality and employability. Amongst the 180 participants from 25 different countries worldwide, 10 alumni of the ASEAN-QA project were able to join and enhance the presentations and discussions. The Policy Forum thematized current topics of the quality assurance debate like the significance employability should have within the internal quality assurance. Next to the academic perspective of quality, the acquisition of practical skills becomes evermore important for students and should be observed during the IQA process. Questions like how to find an appropriate balance between both and which stakeholders should be involved during the design and review of study programmes were discussed. A detailed report of the IIEP Policy Forum can be accessed here.